Create your own piece of musical paradise with this kit, which includes all the necessary parts. Never insult a ukulele by calling it a small guitar. Petite in stature, yes. But big on a unique sound that puts us on a Hawaiian island, sipping from a pineapple between jam sessions (ukulele players have jam sessions, right?). Create your own piece of musical paradise with this kit, which includes all the necessary parts. The fretboard (the part strings go over) and neck are already glued and attached, so you don't have to worry about misaligning the neck or gluing mishaps. That'll leave time for decorating with your own paints and stickers. 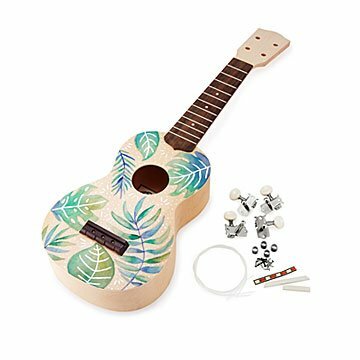 Give one to the friend who always starts the singalong, or someone just starting out on their ukulele journey. Made in China. Great gift from "ME"(I'm Santa....to our 3 sons/and, grands and great-grands) LOVE your shop/you don't see the things anywhere but UnCommon Goods!